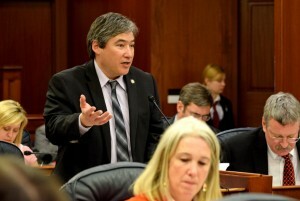 Rep. Sam Kito III wants to repeal the ballot measure that tried to cut the Alaska Legislature’s annual session to down from 120 days to 90. Kito said it would increase staff and per diem costs, but thinks that may be offset by savings from holding fewer special sessions and other efficiencies. An official cost estimate is in the works. So far, Kito says he’s gotten mixed feedback from his colleagues. Kito’s House Bill 223 is the fourth legislative attempt to change the 90-day session since 2006 when Alaska voters narrowly passed the ballot measure. In 2011, three Republican lawmakers sponsored separate legislation to extend the session. Then-Senate President Gary Stevens’SB 18 made it the furthest. It tried to add 30 days to the second session of the legislature’s two-year cycle. The Senate passed it 12-5, but it died in the House Finance Committee along with Rep. Paul Seatons’ HB71, a straight repeal. As a co-chairman of the House Finance Committee, Bill Stoltze was the gatekeeper that kept the bills from advancing. Stoltze is now in the Senate. The legislature’s lawyers have said it is unlikely breaking the 90-day statute has any legal consequence because it’s still trumped by the 120-day rule in the constitution. Lawmakers have tried to respect voters’ intent, but have also run over the 90-day limit and held frequent special sessions for extra time. Jeremy Hsieh is the deputy managing editor of the KTOO newsroom in Juneau. He’s a podcast fiend who’s worked in journalism since high school as a reporter, editor and television producer. He ran Gavel Alaska for 360 North from 2011 to 2016, and is big on experimenting with novel tools and mediums (including the occasional animated gif) to tell stories and demystify the news. Jeremy’s an East Coast transplant who moved to Juneau in 2008.